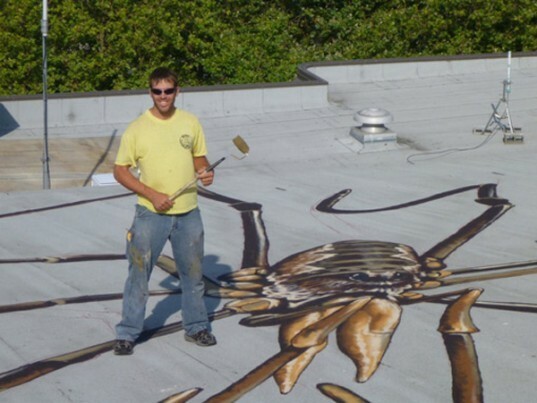 B-movie lovers and arachnologists will love Marlin Peterson’s giant daddy long-legs mural painted on the roof of the Seattle Center Armory. The rest of us on the other hand will be sufficiently creeped out when viewing the gigantic monsters from above. Larger than life, the rather unsettling image can be easily seen from the Seattle Space Needle, and it’s been startling tourists with its realistic depiction and enormous scale. Science illustrator and artist Marlin Peterson has a healthy sense of humor to complement his amazing artistic talent. Commissioned by the Washington State Artist Trust to paint a mural somewhere in the city of Seattle, Peterson originally searched for a wall large enough to complete his piece. After an unsuccessful hunt, he decided on the roof of the Seattle Center Armory (formerly the Center House). He completed the two massive paintings of daddy long-legs using a technique known as “trompe l’oeil“, a method that uses realistic imagery and optical tricks to create the illusion of three dimensions. 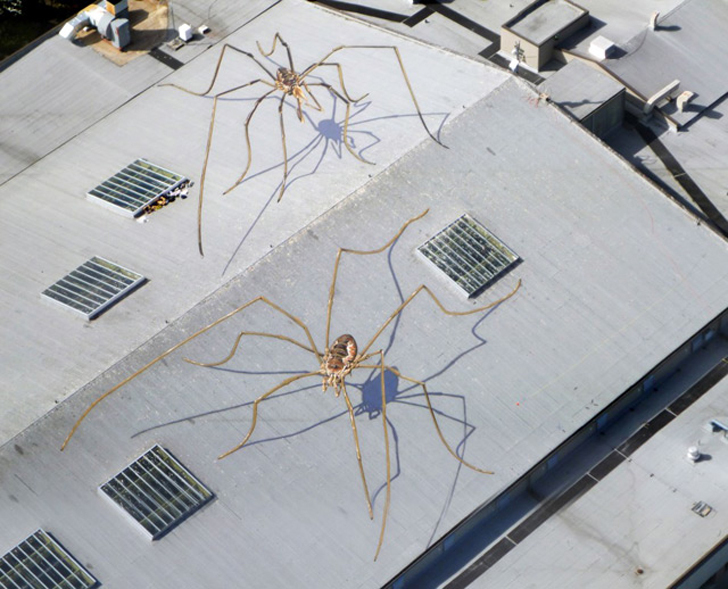 The arachnids appear as though they are crawling across the top of the building, complete with looming shadows cast by spindly legs and fat, suspended bodies. H.G Wells would certainly be proud! B-movie lovers and arachnologists will love Marlin Peterson's giant daddy long-legs mural painted on the roof of the Seattle Center Armory. The rest of us on the other hand will be sufficiently creeped out when viewing the gigantic monsters from above. Larger than life, the rather unsettling image can be easily seen from the Seattle Space Needle, and it's been startling tourists with its realistic depiction and enormous scale.